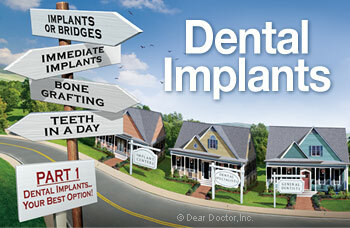 Pick up most magazines or newspapers these days and you're likely to see an ad about dental implants. And with the advent of “implant centers” in major metropolitan areas, television ads are now delivering the message that an implant center, with everything conveniently offered under one roof, is the state-of-the-art choice for dental implant treatment. Some even extol the virtues of getting your new “Teeth In A Day!” Bombarded with so many different messages about dental implants, how does the consumer make the right decisions? While this kind of marketing distorts the limits of our current research and knowledge, this new end of the spectrum may not necessarily end in a rainbow. This important and controversial topic will be covered in two parts. A clear understanding of the increasing options available for implant treatment is a good place to start together with alternative replacements for missing teeth and their economic impact. This first part will also educate you about the problems associated with tooth loss and why implants are considered the state-of-the-art tooth replacement system. In part two, we'll discuss who are the most suitable and experienced dental professionals to place implants. We will discuss the why, when and where to make your implant choices including how to navigate through the implant marketing hype. Implants provide virtually the same function as natural teeth roots. Let's begin by taking a look at what makes implants the most optimal tooth replacement system today. An implant connection to the bone is different than how a tooth connects to the bone but it performs the same function. Dental implants act as substitute tooth roots in a unique way. Implants actually stabilize bone and prevent the inevitable bone loss that occurs when teeth are lost. Commercially pure titanium, of which almost all current implant surfaces are made, has the unique property of being “osteophilic” (osseo-bone, philic – loving), thus joining biochemically to bone. Osseo-integration (osseo – bone, integrate – to join or fuse with) was discovered quite by chance and has revolutionized dentistry. The fusion is almost like a pillar in concrete, allowing no movement at all. Stresses of biting forces are transmitted directly through implants to the bone — which they allow for very well. They provide virtually the same function as natural teeth roots, including stimulating the bone, thereby stabilizing it and preventing its loss. The bone that encases the teeth known as “alveolar” bone, (from alveolus – sac, an extension of the jaw bone), is the special bone that surrounds and supports the teeth. It develops with the teeth as they erupt into the mouth, accompanies the teeth in life and is lost when the teeth are removed. As one famous scientist put it, “Alveolar bone is like any other bone in the body, it just lives more dangerously,” said Dr. Harry Sicher. When teeth are lost or removed the alveolar bone, which is fragile in structure like an ice cream cone, “resorbs” or melts away. What complicates matters is the “pattern” of resorption or the melting away process. Where the bone is thinnest, it resorbs more quickly. This is particularly true for the upper front teeth where bone, gum and even the lips can appear to cave in or collapse. The dental literature indicates that 79% of the population has a smile line that will not cover these types of “defects.” This is very noticeable when smiling and many people become quite self-conscious about their appearance as a result.